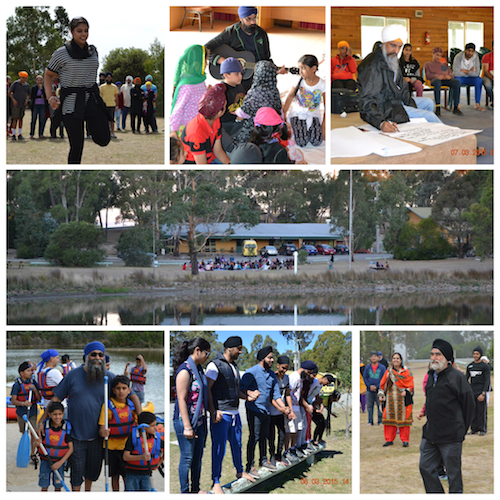 Sikh Naujawan Melbourne held its annual Sikh Family Camp during the recent Labour Day long weekend (in Victoria state of Australia), 6-9 March 2015 at the tranquil, spacious Campaspe Downs in Kyneton, about 85km from the city of Melbourne. 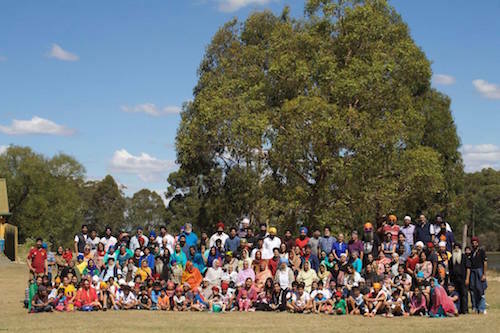 The weekend camp was attended by 200 participants ranging from babies to grandparents, with the Sri Guru Granth Sahib gracing the attendees on all the four days. The theme for the camp was Gurbani Is Jag Meh Chanan, Karam Vasai Man Aae (Gurbani illuminates our way in this world, (but) Gurbani will reside in our inner-self through the Guru’s blessings). The facilitators of the camp consisted of the evergreen Veer Hari Singh from New Zealand and a team of Veer Harcharanjit Singh (affectionately known as Raja), Veer Sukdarshen Singh, Bhen Kashminder Kaur and Veer Ajit Singh from Malaysia. They were complemented by Veer Jasbir Singh Suropada who is the vice-chairman of the Sikh Interfaith Council Victoria and has a vast experience in family counselling. Attending the camp was like being on a holiday: away from our work and the routines of family life with kids. The only difference of this holiday compared to the other holidays (i.e. going back to our hometown or visiting another town/country) is that here we are spending time to inspire ourselves and renew our love for Sikhi by learning from the facilitators who have spent their times researching, understanding Sikhi and sharing their knowledge with us, the participants. Veer Hari Singh’s interpretation and presentation of understanding Gurbani was indeed commendable. He made a point to never compare ourselves with others as we are individual miracles of Waheguru’s creation. There are at least 7 billion people on earth and yet, no two thumb prints are the same! He asserts Gurbani is that ‘Chanan’ to realise that whatever Waheguru gave us and this body of ours is His blessings. Just reading bani is not enough. We need to understand what the bani is saying, only then we will feel the love for Waheguru. He suggested for a few families to get together to further understand shabad from Gurbani by referencing to Sri Guru Granth Darpan (translations) which is a great resource and to do a discussion and motivate each other. He also highlighted on the necessity of going to Gurdwara at least on a weekly basis as getting the blessings of the bigger sanggat (congregation) is the utmost importance. He reiterated that there should never be any excuses of not being able to go to Gurdwara either to the parent or the child (i.e. homework, exams or bad politics at Gurdwara should not become a hindrance). Veer Jasbir Singh Suropada emphasised on the bonding between husband-wife and parent-child through effective communication which is not just talking but paying attention by listening and understanding what the other has to say. Some of the youth were grumpy to get up in the early mornings (especially after playing soccer at late night). The organisers were not rigid on the morning calls as their aim was to get the youth to attend all the lectures and kirtan sessions. Understanding and developing a love for Sikhi that will last forever is favourable than a forced love that will only retaliate. The group dynamics activities held in the afternoon were mind-blowing. At the conclusion of each activity, Veer Raja and Ajit Singh related it back to what being taught earlier in the classes. Veer Raja shared his personal experience of growing up and that of his friends with the youth. He also warned the youth not to think of trying smoking as it is the very first step to get addicted to drugs and always remember Ang 554 in SGGS Ji with regards to alcohol. Veer Hari Singh highlighted on accepting hair as a part of our body given by Waheguru and quoted on how to deal with such people who ridicule, “It is my body, why are you such a busybody.” Veer Jasbir Singh showed a video on teen’s brain being fully developed by the age of 25 which means till then, they are prone to making impulsive decisions. Hence, youth do need their parents’ guidance in decision-making. On the other hand, the younger children enjoyed mingling with other Sikh kids while learning from Veer Sukdarshen Singh and Bhen Kashminder Kaur who taught through lots of fun activities on overcoming fear, making good choices vs bad choices, awakening Mr Truth within us and discarding Mr Ego. It was a blissful time participating in the Nitnem, Simran, Asa Ki Var and the Kirtan sessions. Not to forget all the yummy food which was a mix of Punjabi, South Indian, Malaysian and Western cuisine and sports activities such as canoeing, flying fox, family walk, tele-matches, aerobic and soccer tournament. The facilitators indeed deserve a round of applause for their excellent presentation. Kudos to the organisers and sewadars of the camp too. The organisers had taken time out of their work and family lives to plan for this camp months before to ensure a smooth running of the programmes. It is a big achievement to the organisers and the facilitators even if one participant had benefited from the camp and fall in love with Sikhi, Waheguru and started walking on His path. The family camp is indeed a holiday camp since we are able to get away from our normal routines, relax among our families and friends and enjoy the good food while we are learning about the greatness of Waheguru, to understand Him, to love Him and to unite back to Him, i.e. “mann tu jot saroop hai, apna mool pehchan” (O my mind, you are the image of the Divine Light, so recognise your own origin) and “Bhai prapat manukh dehuria. Gobind milan ki ih teri baria” (This human body has been given to you. This is your chance to meet the Lord of the Universe).